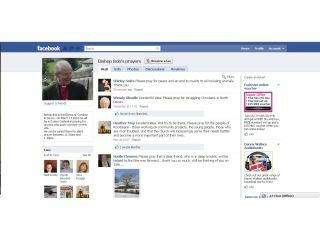 The Bishop of Crediton, Robert Evens, has set up a Facebook page where he will take prayer requests during Lent. Known as Bishop Bob's prayers, the page currently has a meagre 88 fans, but plenty of requests and encouragement in the wall postings. Bishops Evens has promised to offer silent prayer for the requests from 11.30am to 1.30pm on 13 March in Exeter Cathedral. The prayer session is open to the public. Bishop Bob explained his reason for setting up the page: "Prayer is hugely important for many people whether they are churchgoers or not. "I want to encourage people to pray, and many people feel very supported in knowing that someone else is praying for them, or alongside them." The Bishop will also offer prayers when he's on the road, adding "I will be pulling over in lay-bys all over Devon, as well as adding people to my prayers at home each day." He hopes that using Facebook, with its massive base of people, will make prayer more accessible to millions. All prayer requests, he said, will be treated in the strictest confidence. Religion and technology have been coming a lot closer recently, with plenty of religious apps for smartphones, as we detailed earlier this week. No word, though, on whether a prayer for Leeds United to receive automatic promotion to the Championship this season is acceptable.